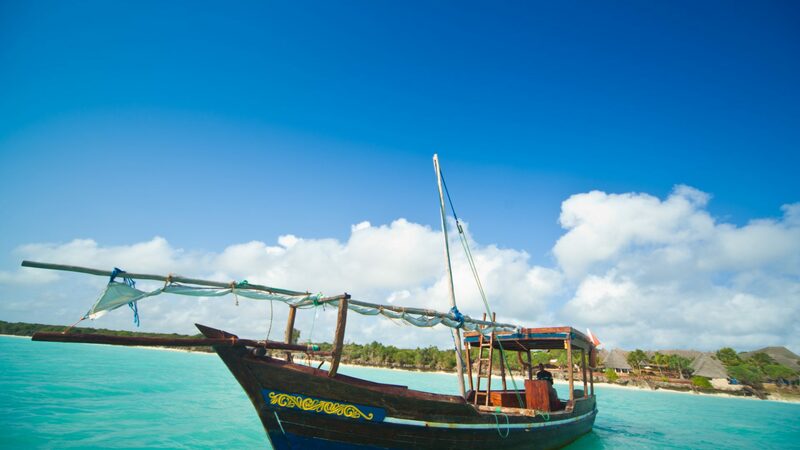 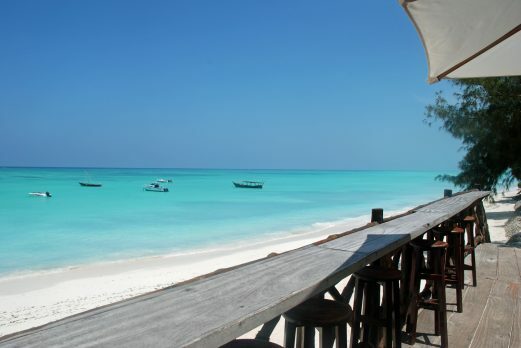 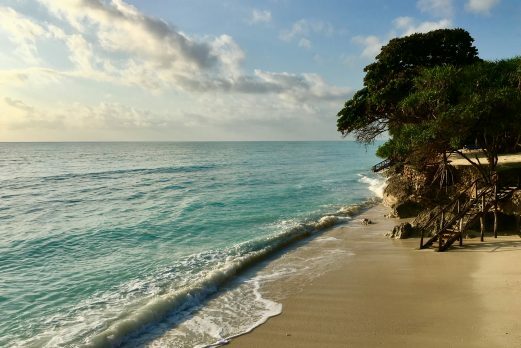 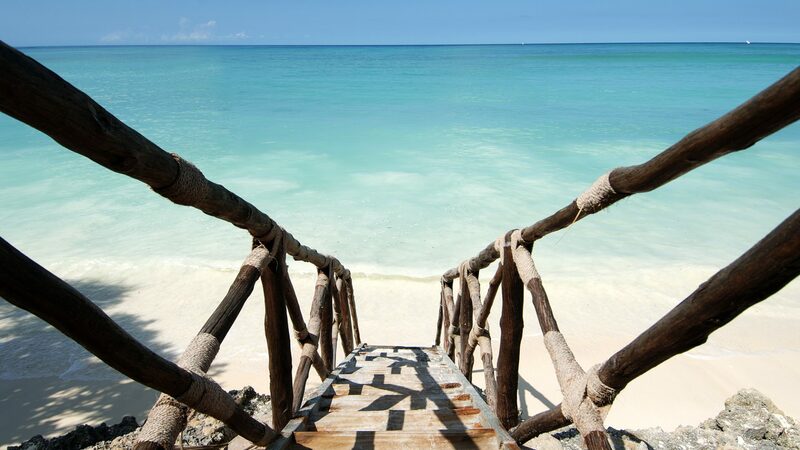 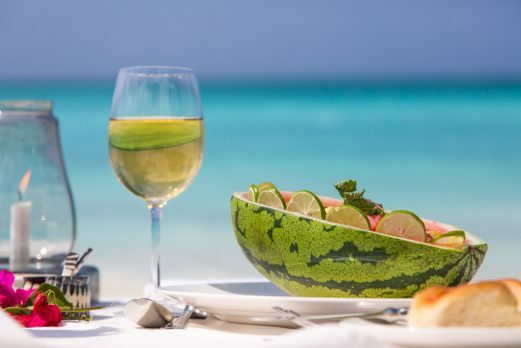 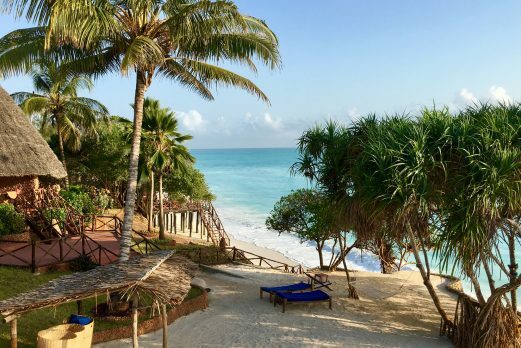 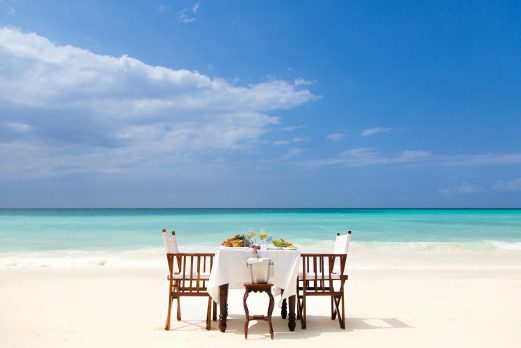 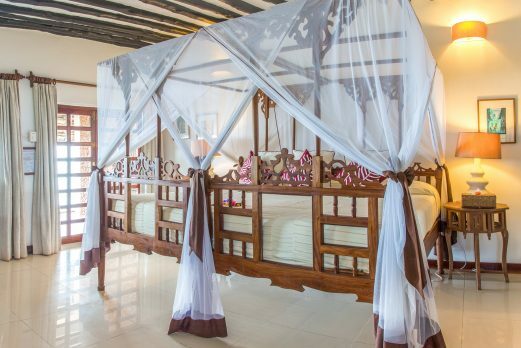 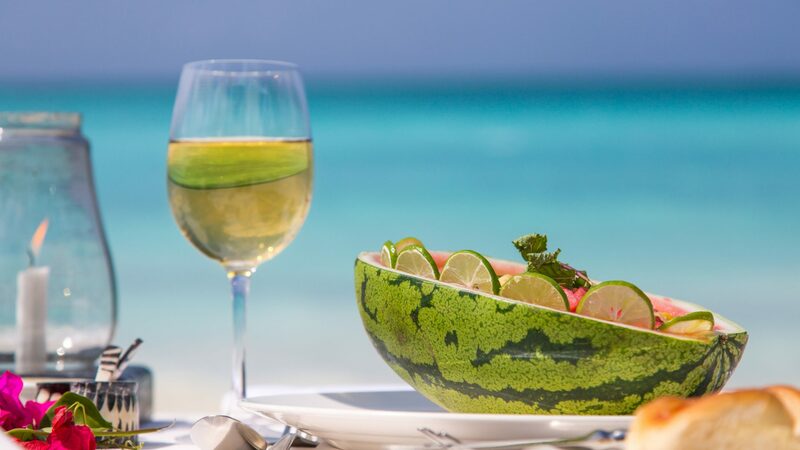 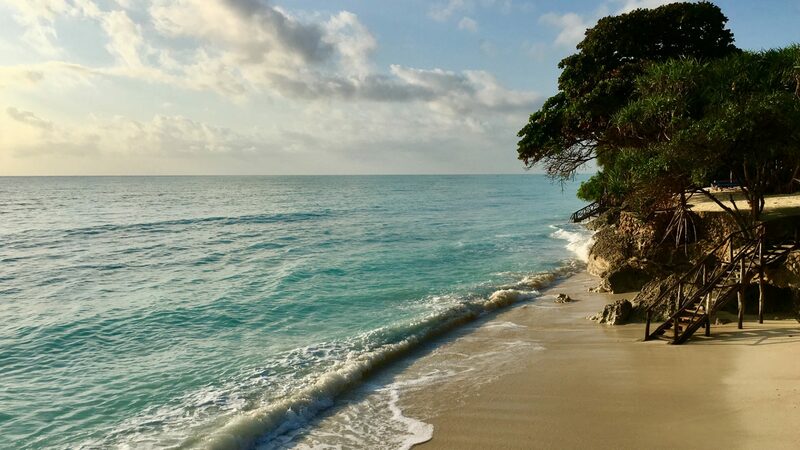 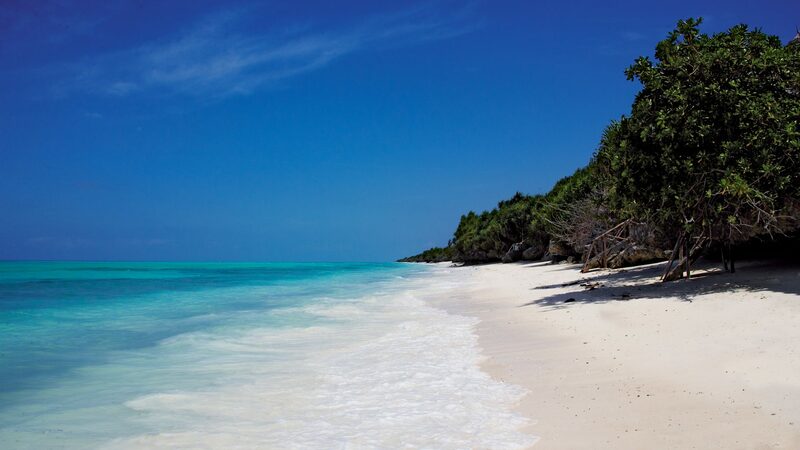 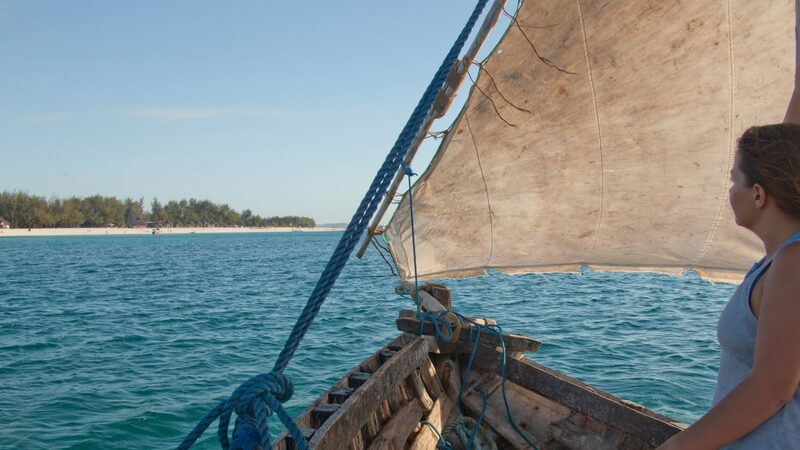 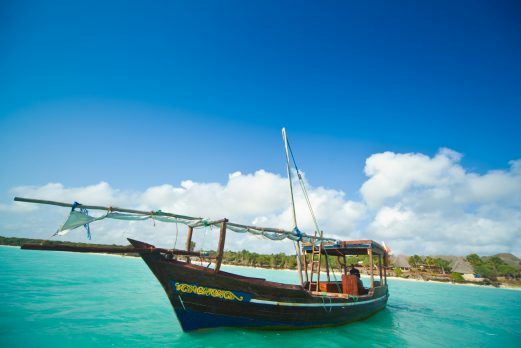 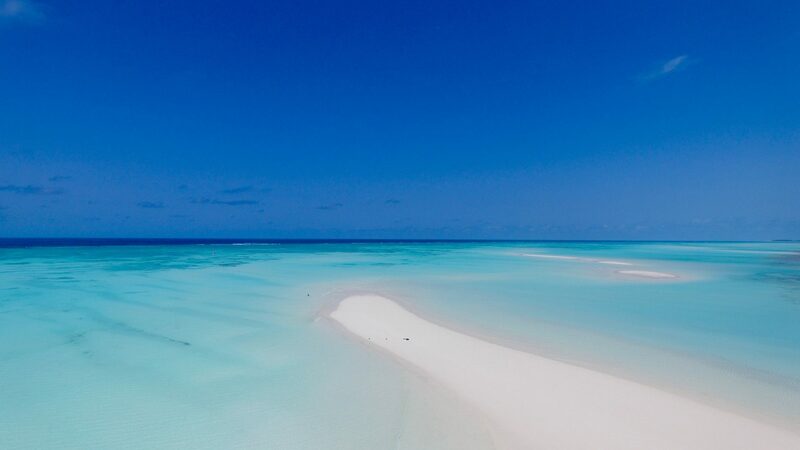 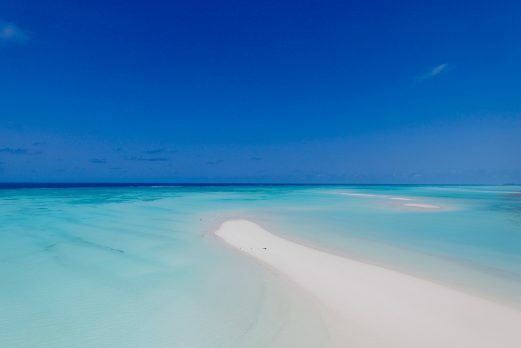 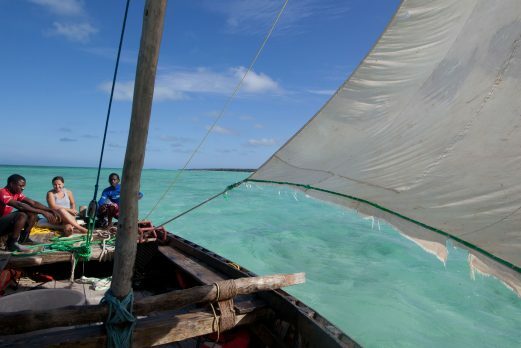 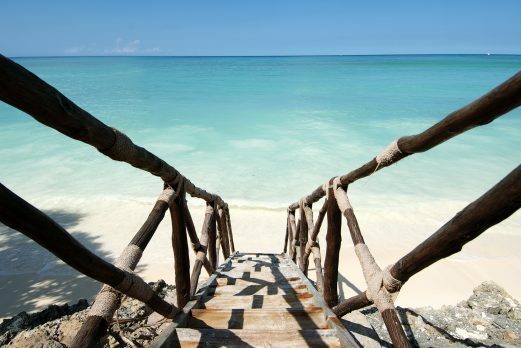 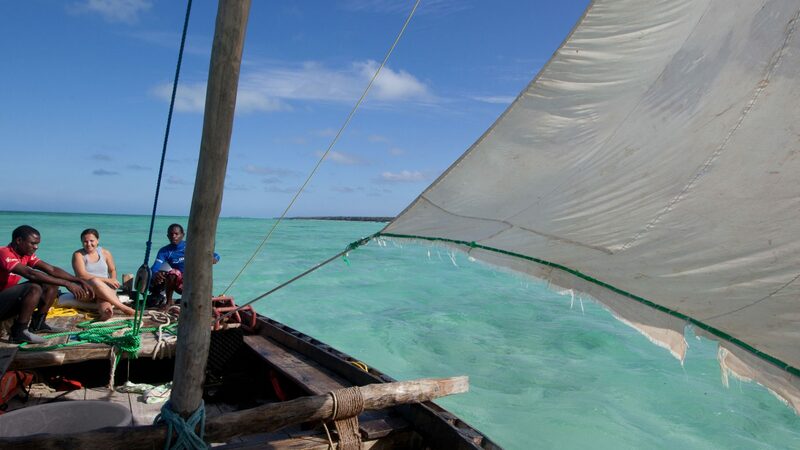 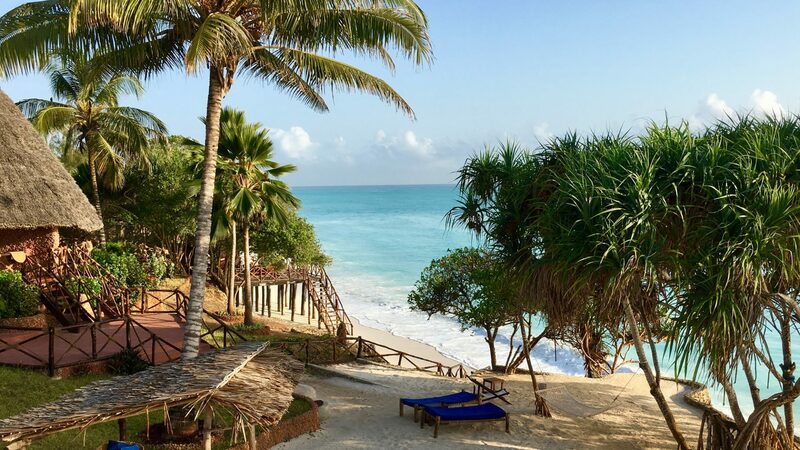 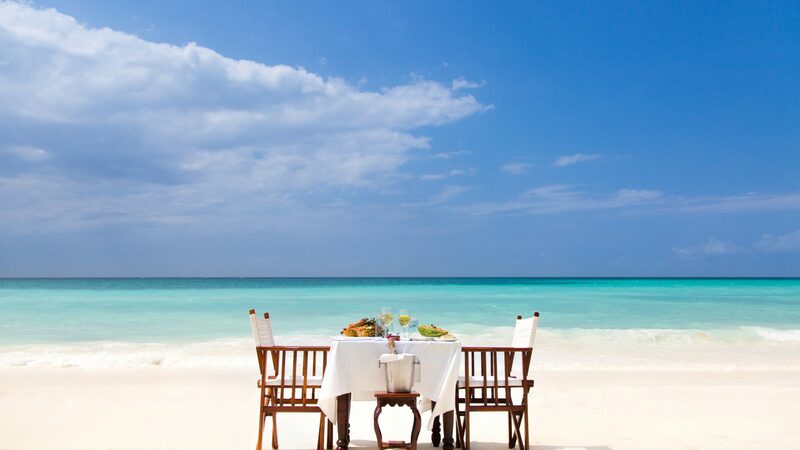 On the northernmost peninsula of Zanzibar Island, Ras Nungwi beach hotel overlooks a wonderful beach and sparkling expanse of iridescent Indian Ocean. 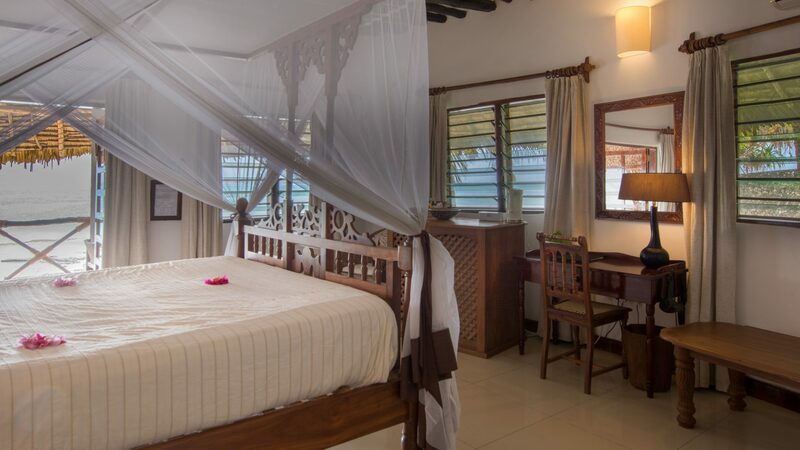 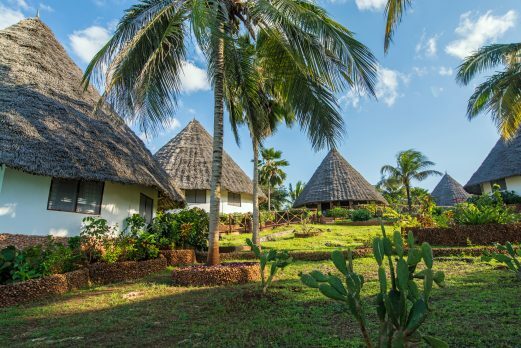 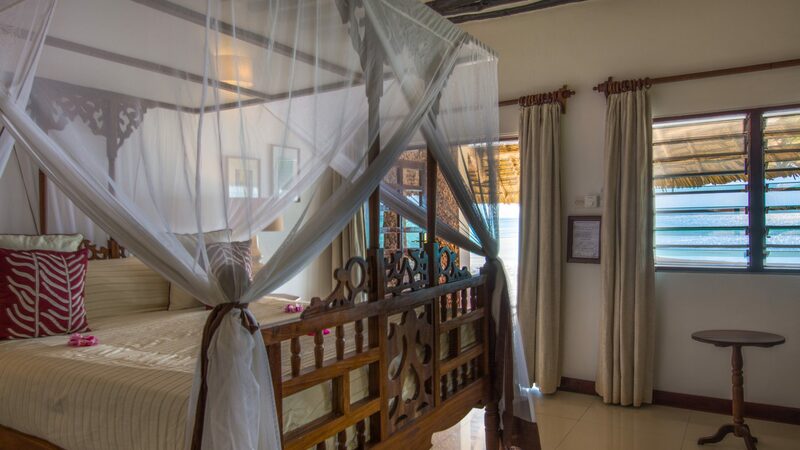 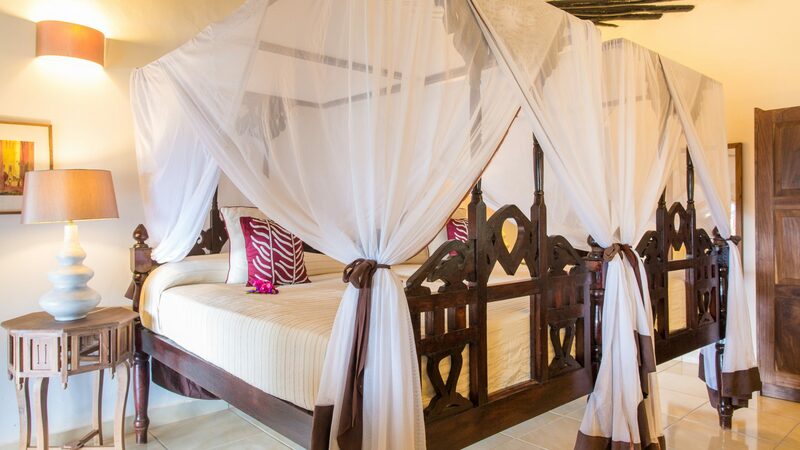 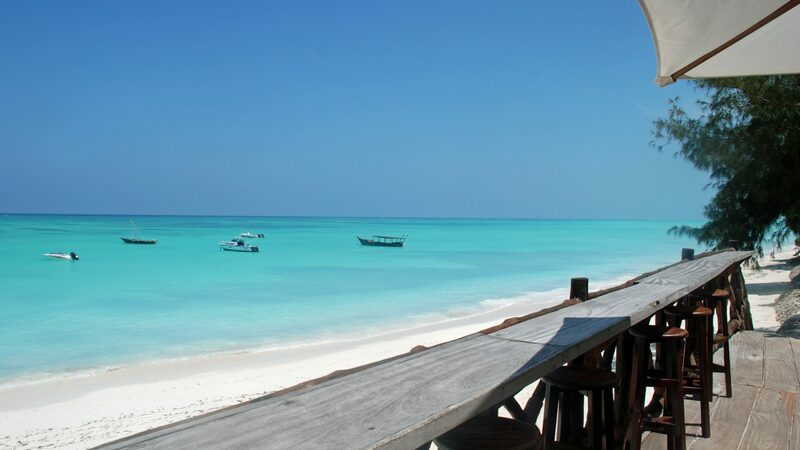 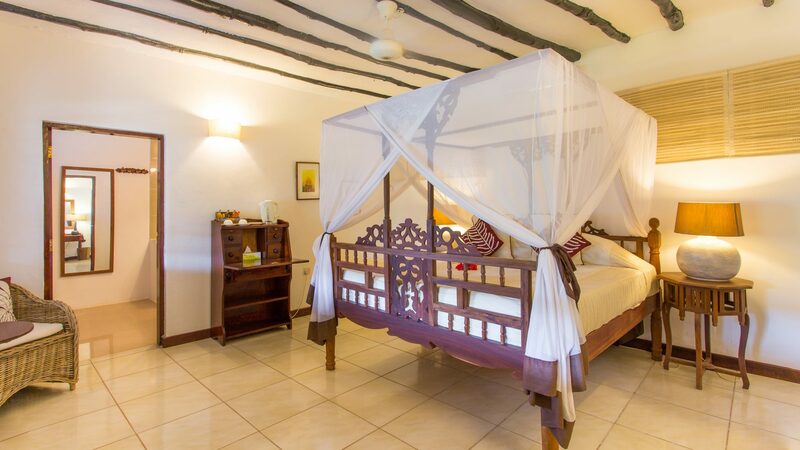 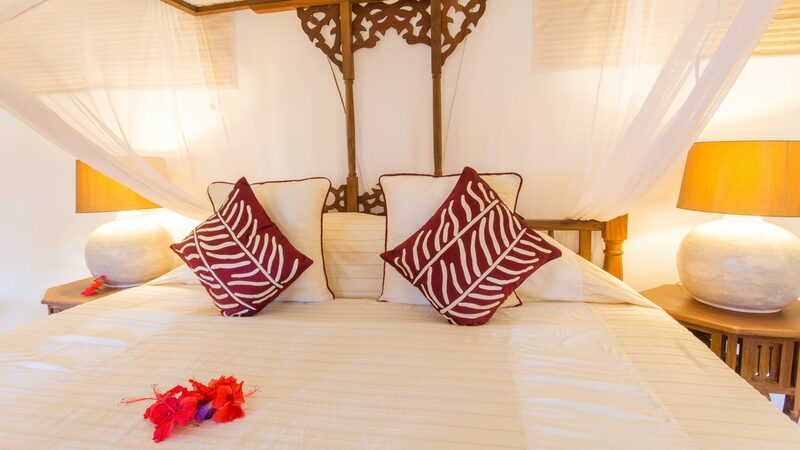 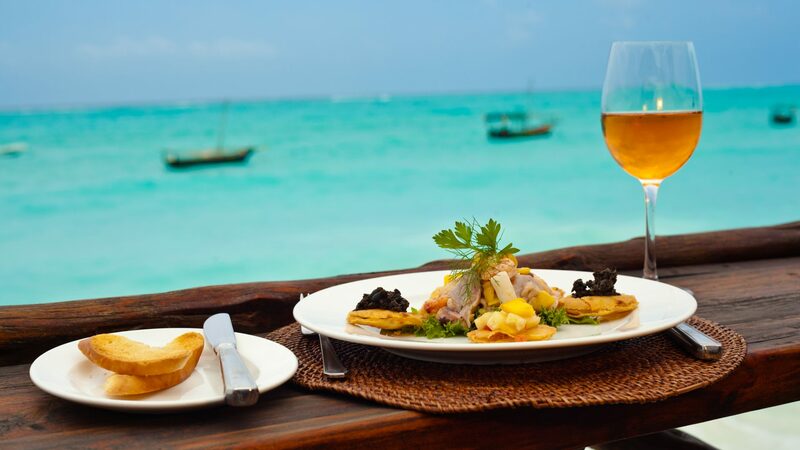 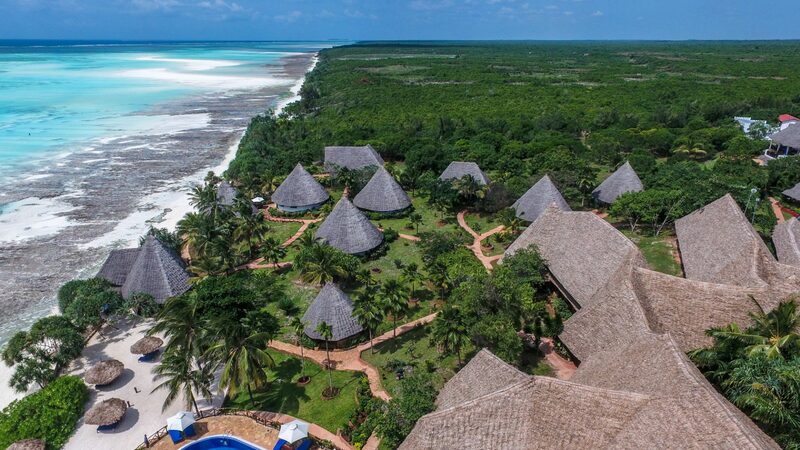 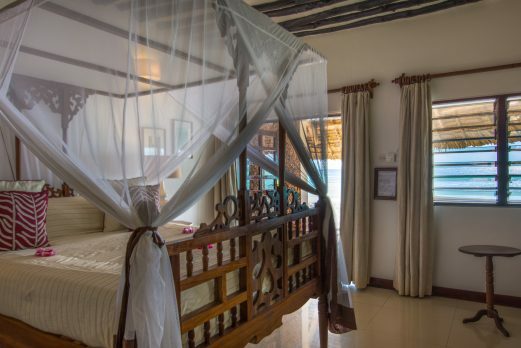 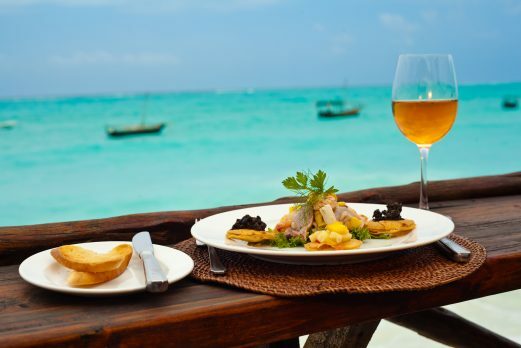 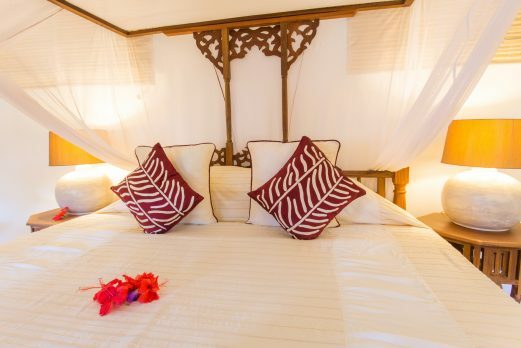 Ras Nungwi is located in the far north of Zanzibar, and offers the most luxurious, small resort style hotel in this area of the island. 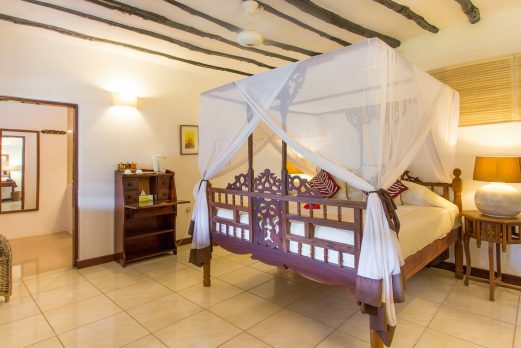 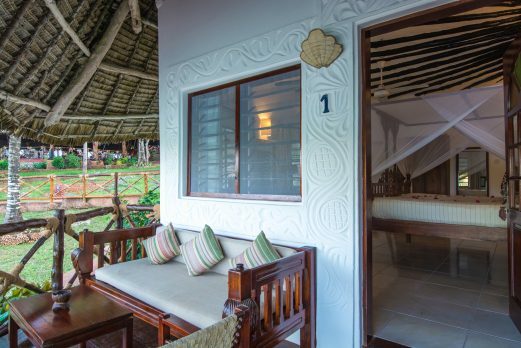 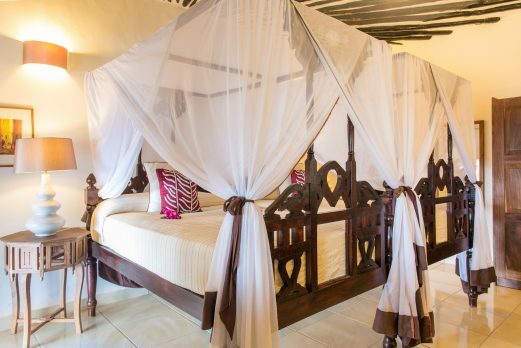 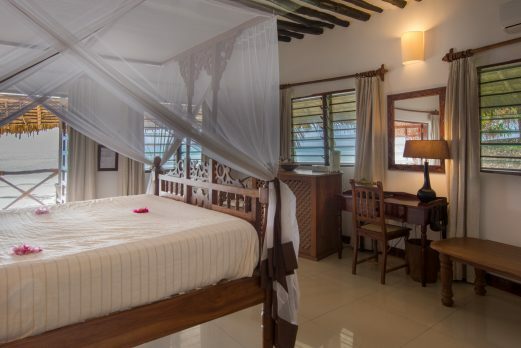 All 32 rooms are tastefully furnished, with hand-crafted four poster beds, indigenous decor, balconies, air-conditioning, ceiling fans, hair-dryers, electronic safes and tiled en suite facilities with deluxe bathroom amenities. 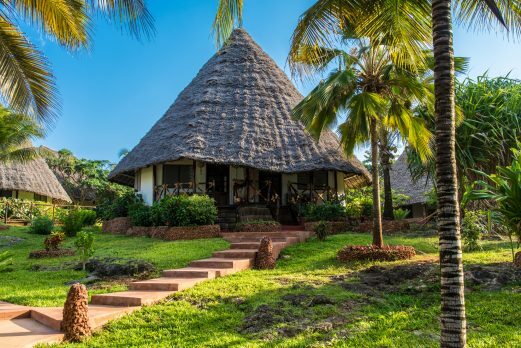 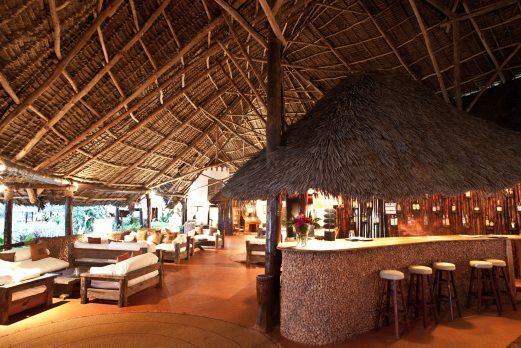 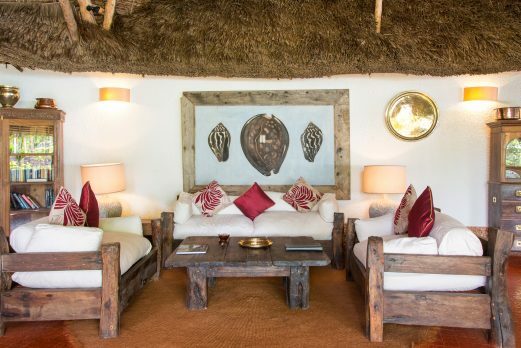 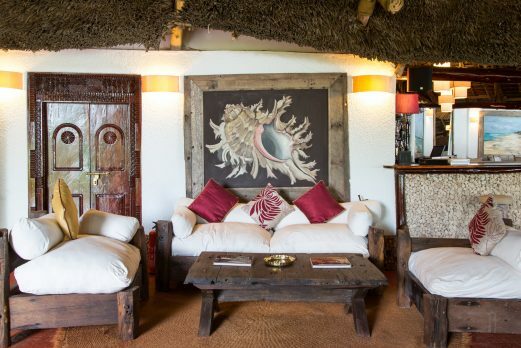 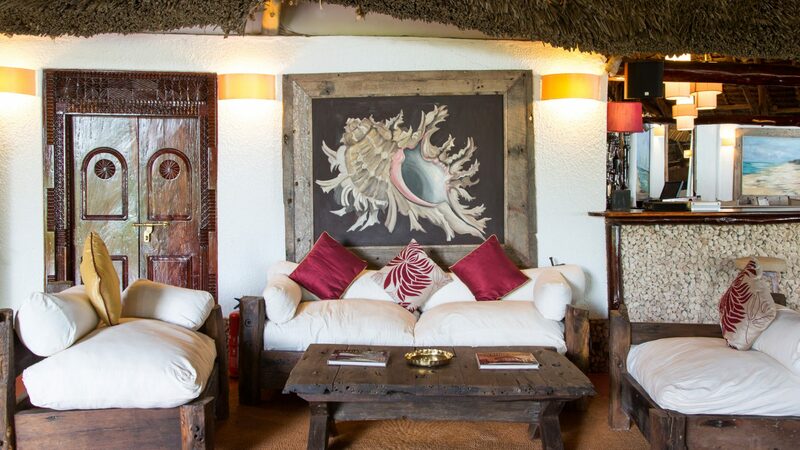 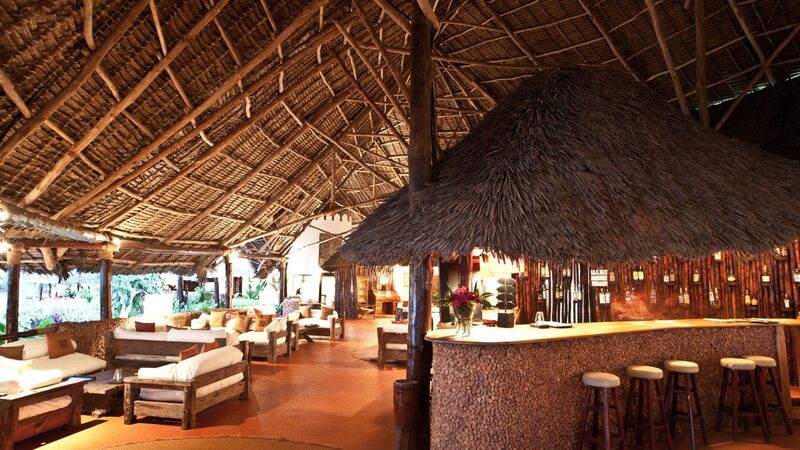 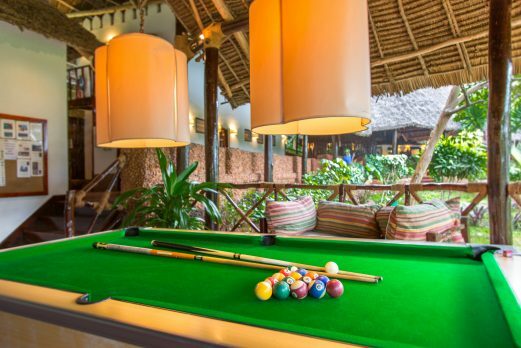 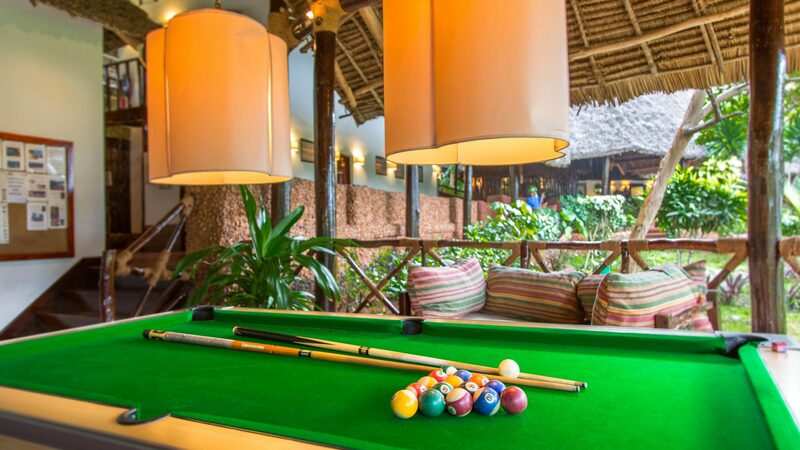 The main lounge, bar and dining area is a split-levelled, makuti-thatched building with lots of light and atmosphere. 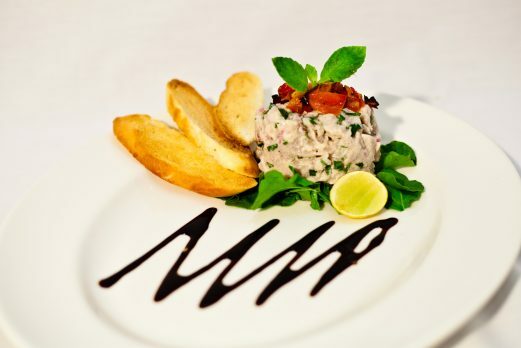 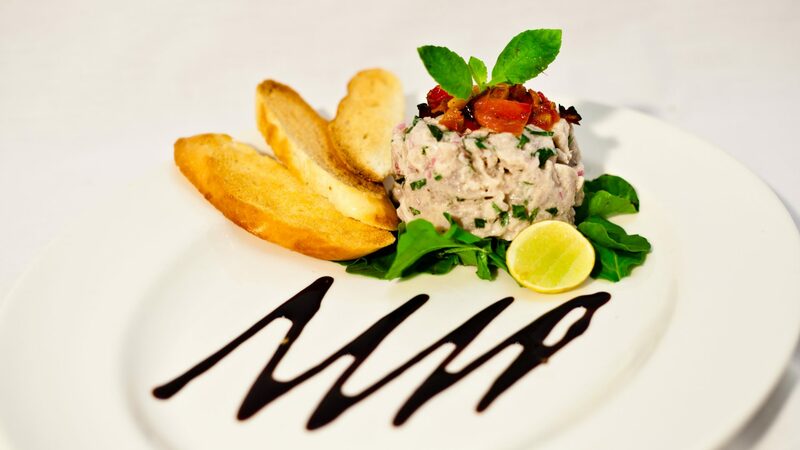 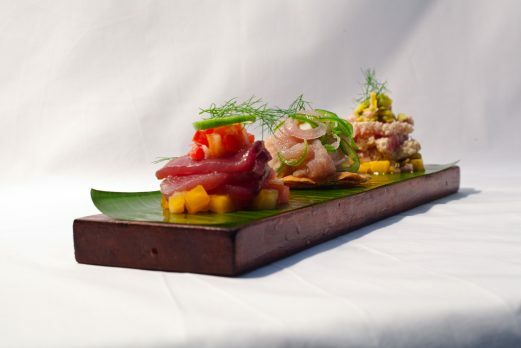 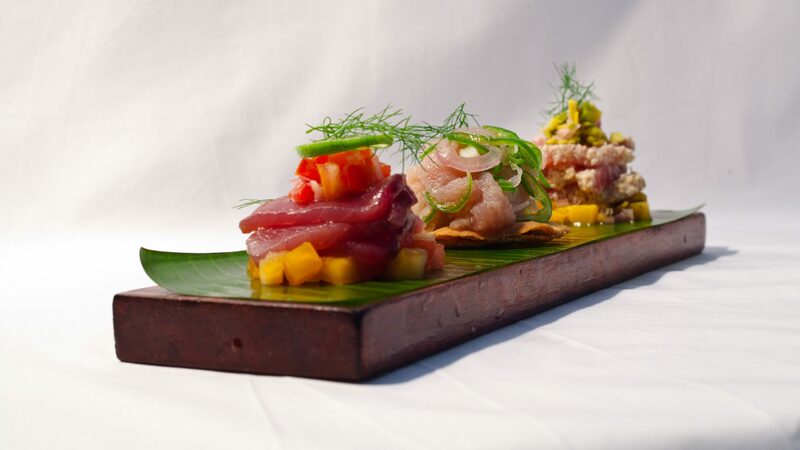 The food is very good and the chefs prepare attractive and appetising menus from an abundance of local ingredients. 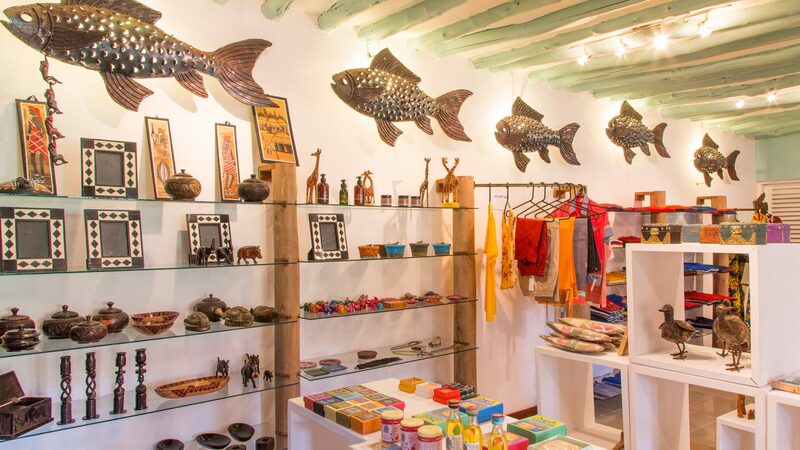 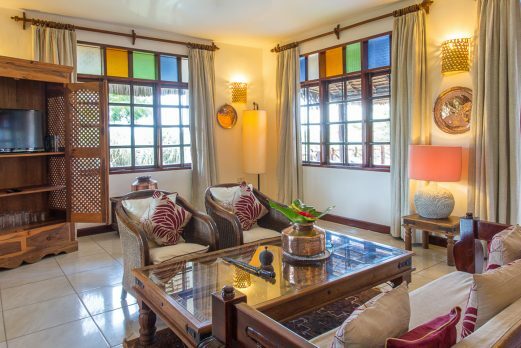 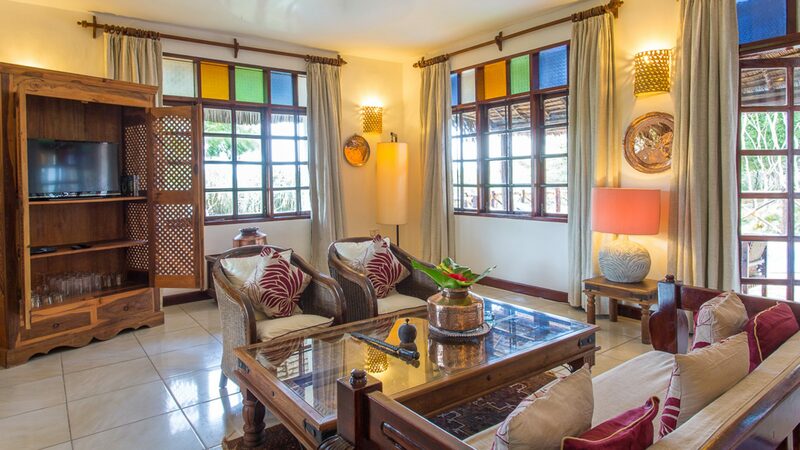 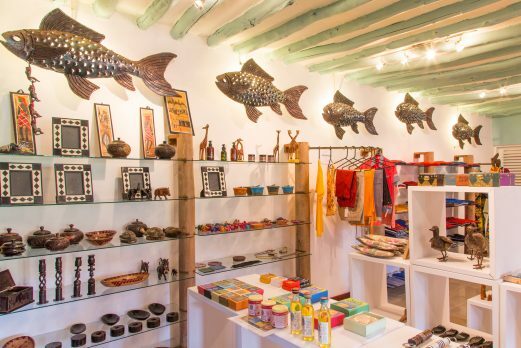 The interiors have been beautifully decorated in an ethnic style using local fabrics such as khangas, kikois and kitenges. 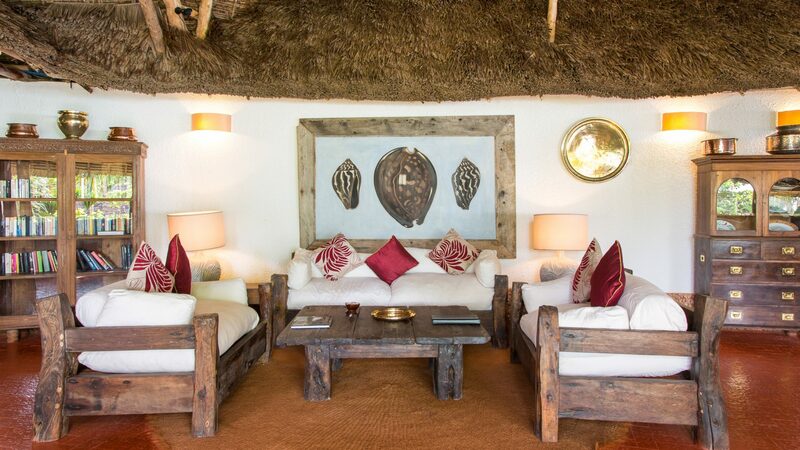 These cloths form an elegant theme of cushioned comfort through the many secluded lounging areas, inside and out. 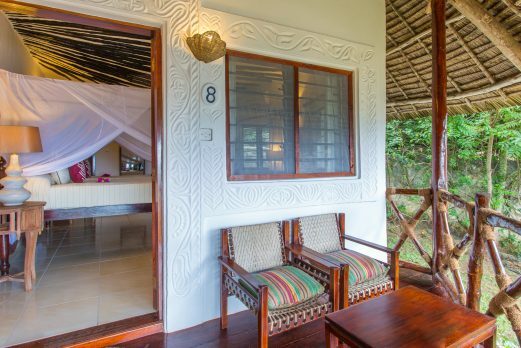 The myriad of pathways are shaded by elegant palms which create soft, sun-dappled walkways between beach and banda, balcony and bar. 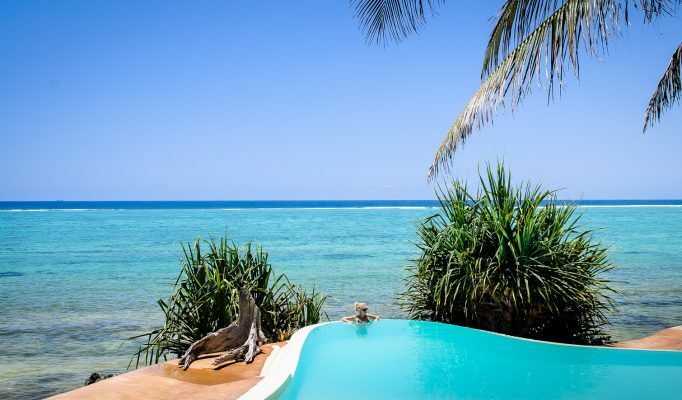 The hotel’s deck-level swimming pool is lined with glass mosaic tiles in shades of blue, and commands stunning views of the Indian Ocean. 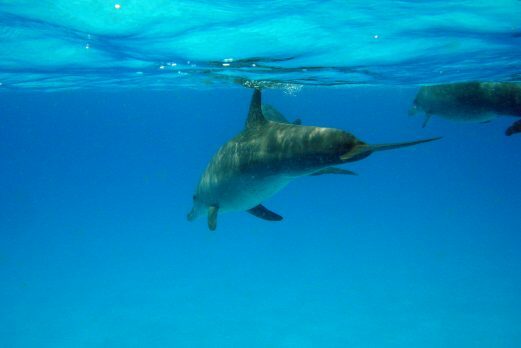 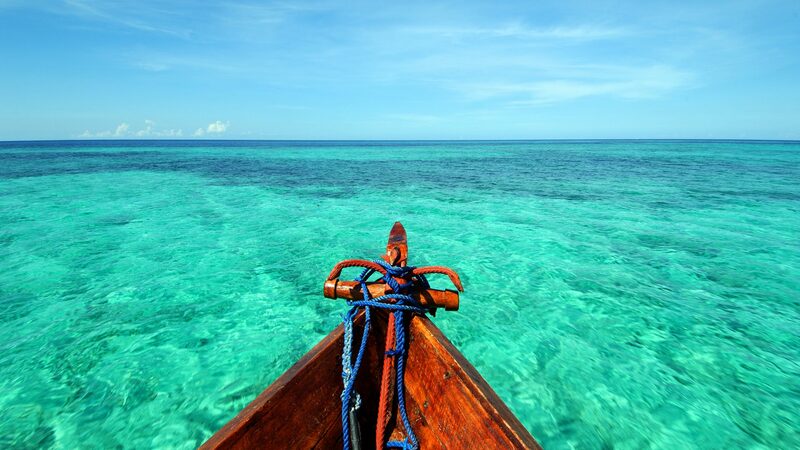 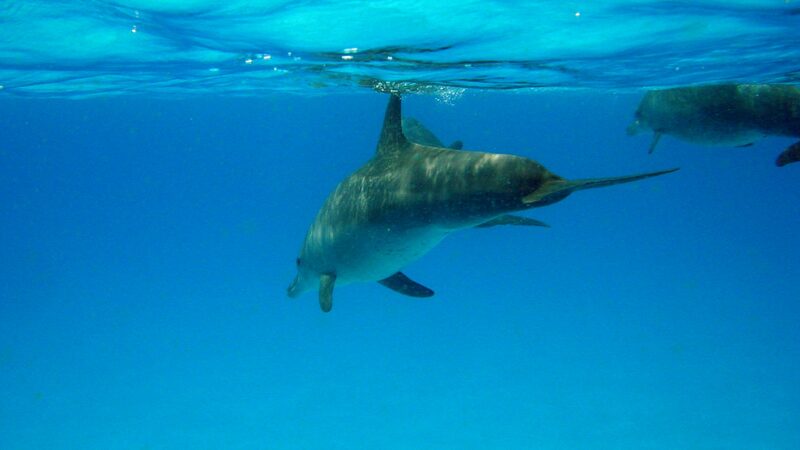 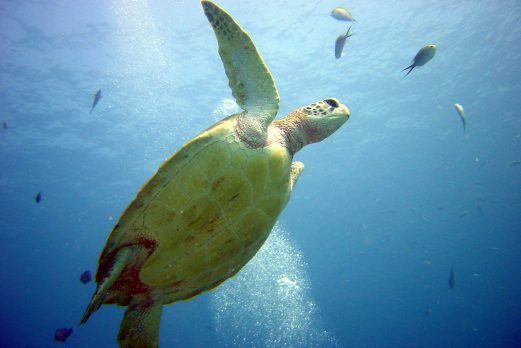 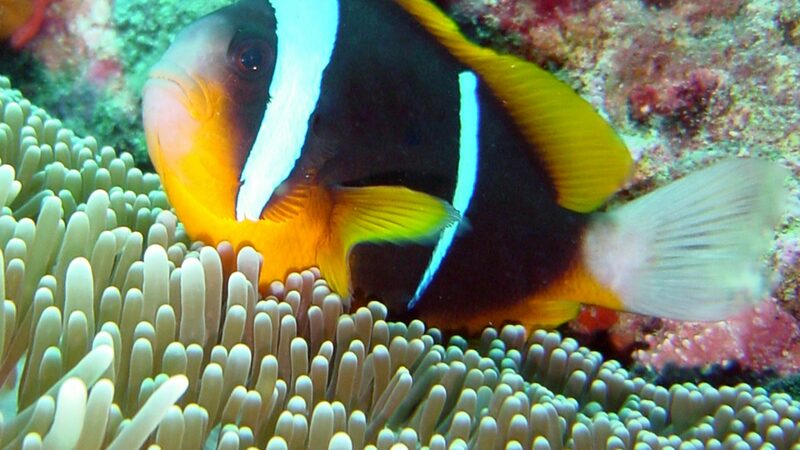 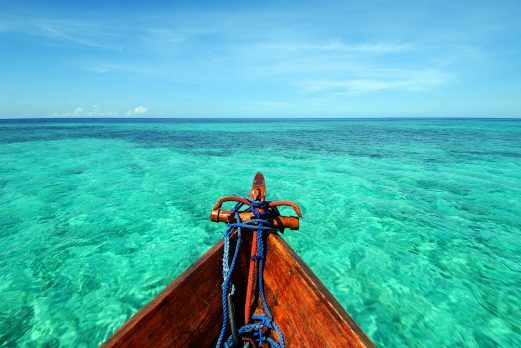 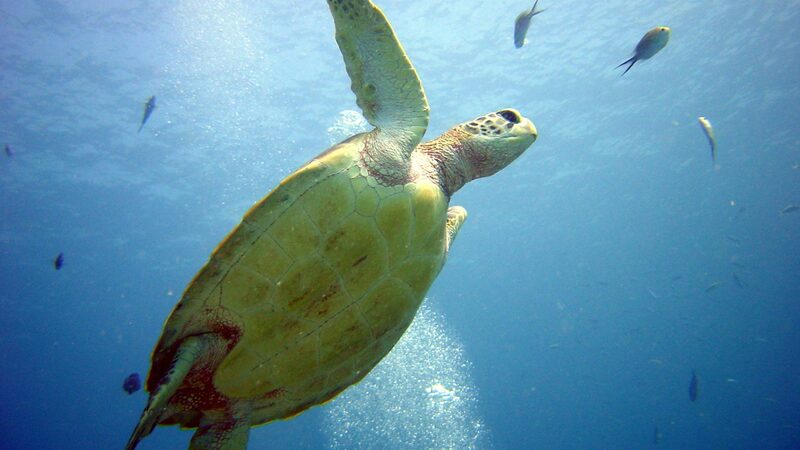 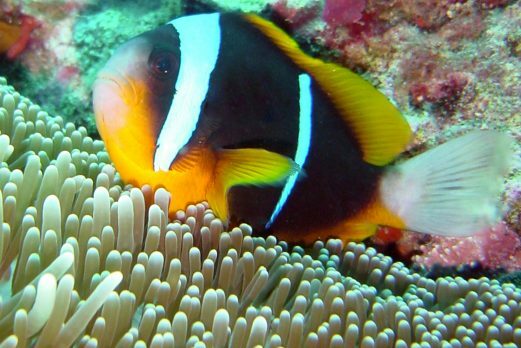 The surrounding reefs create a very exciting area to dive and snorkel and are home to flourishing populations of dolphin, turtles, and countless other marine species. 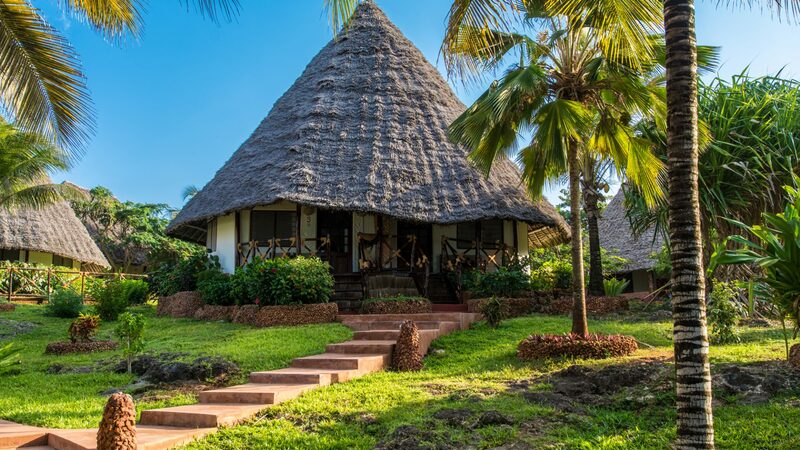 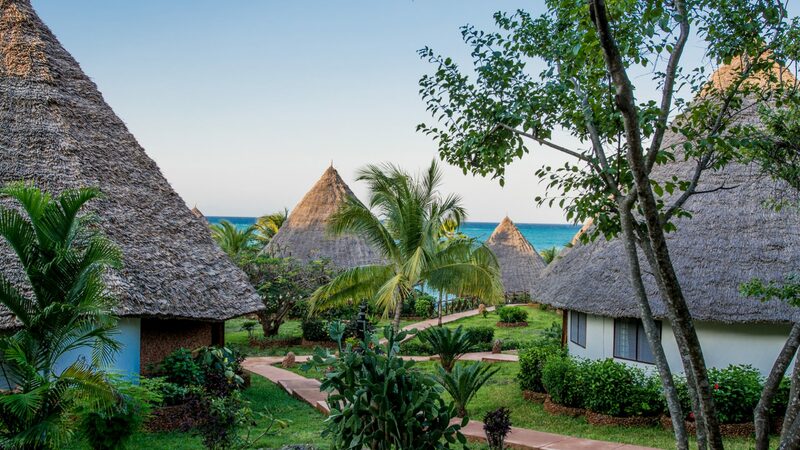 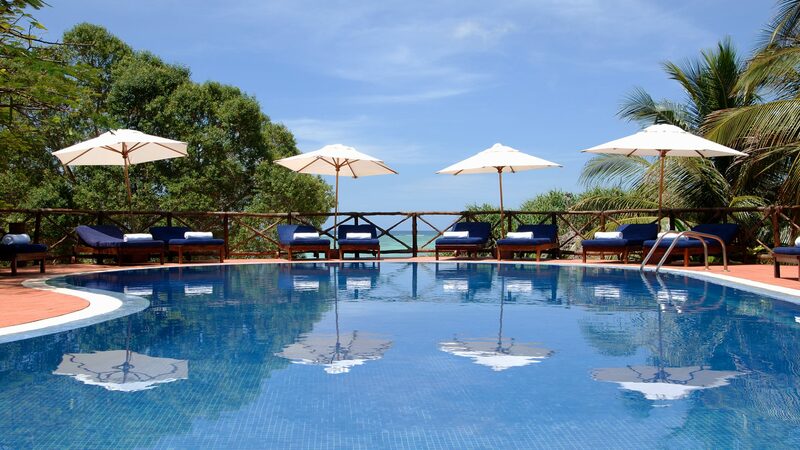 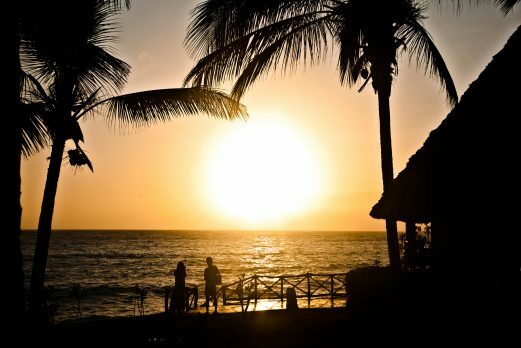 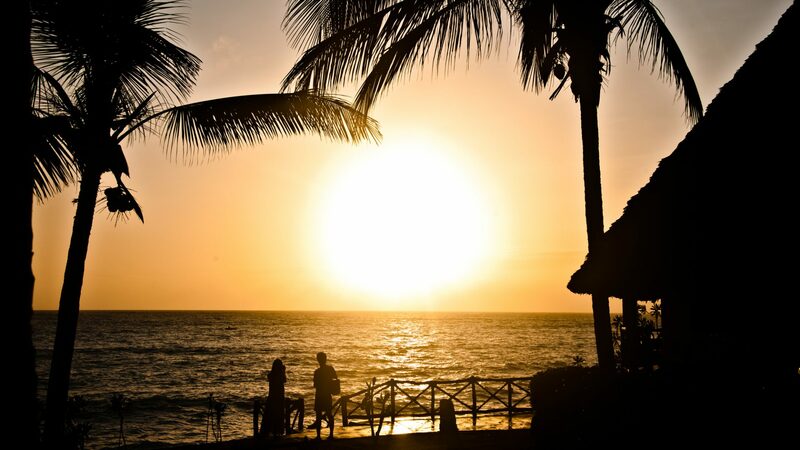 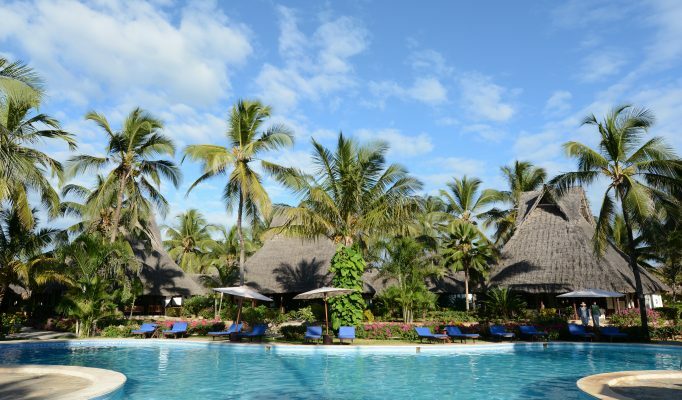 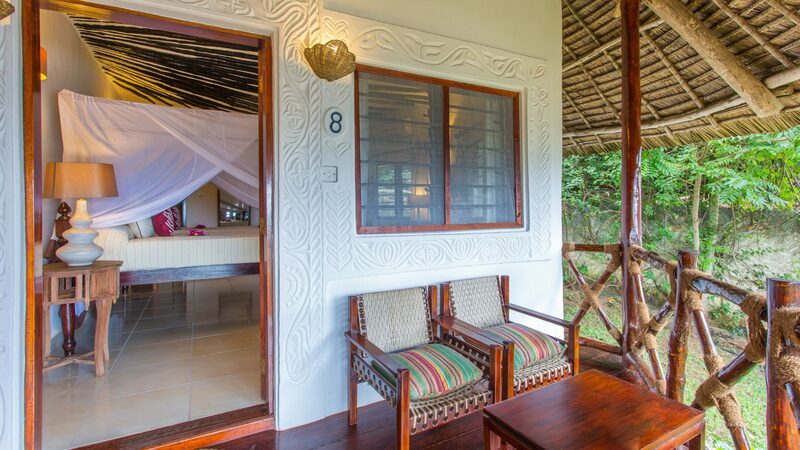 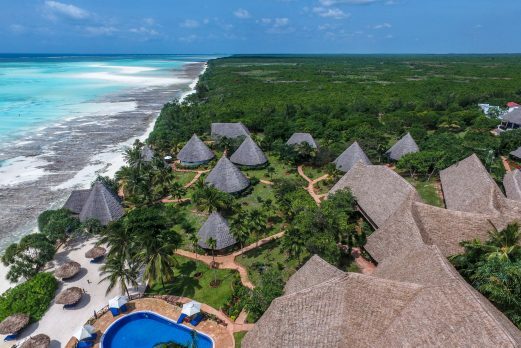 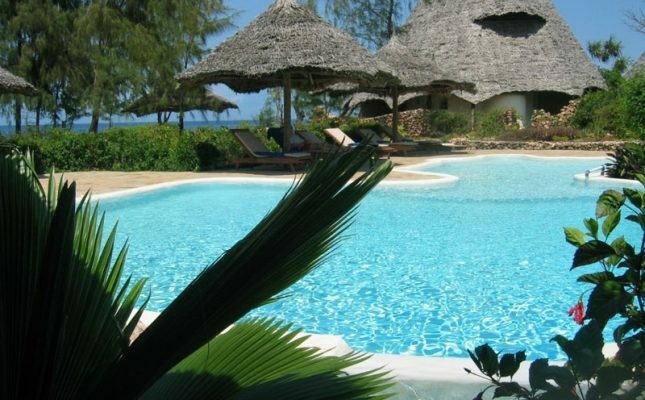 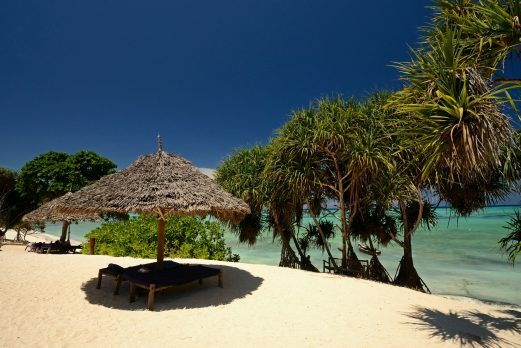 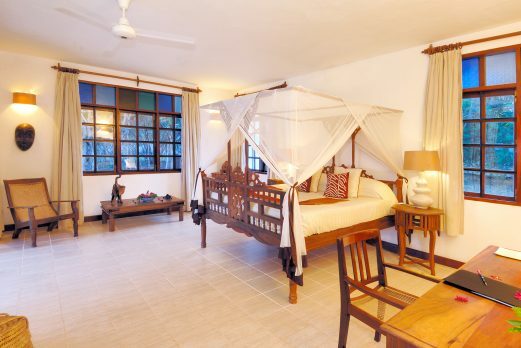 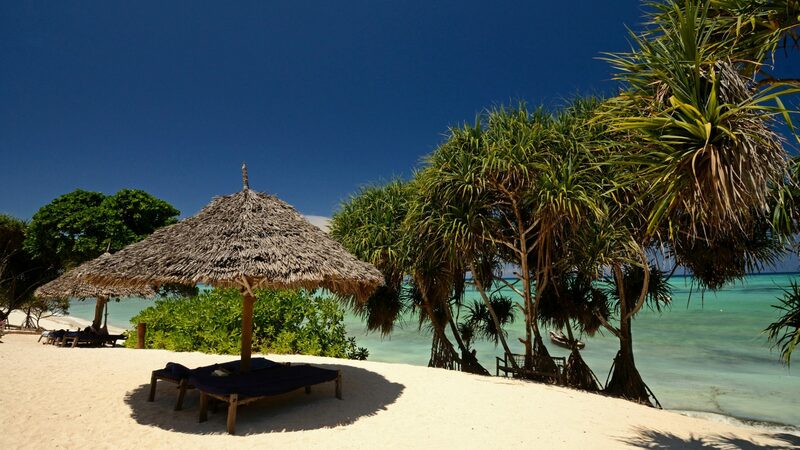 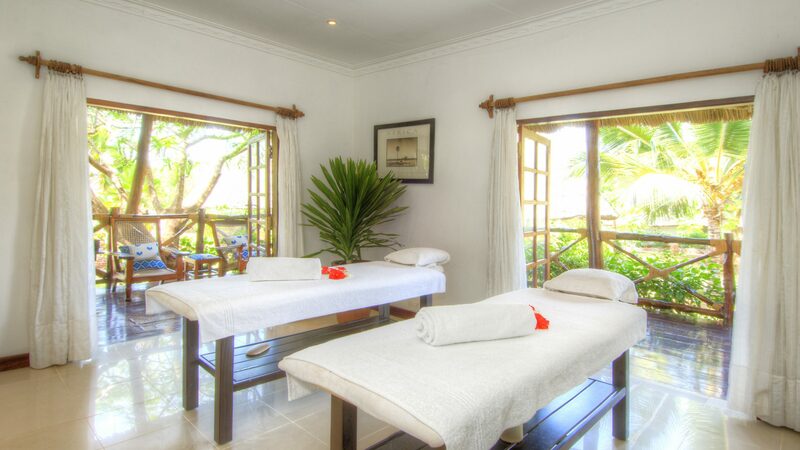 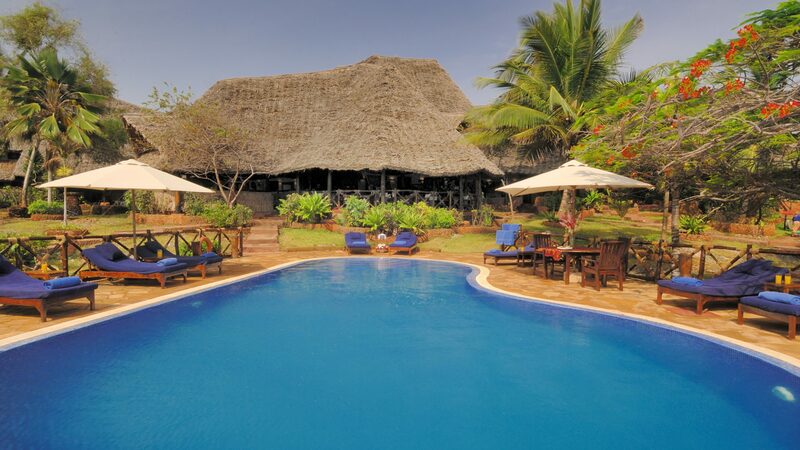 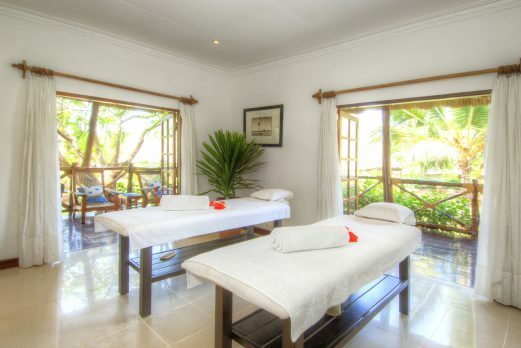 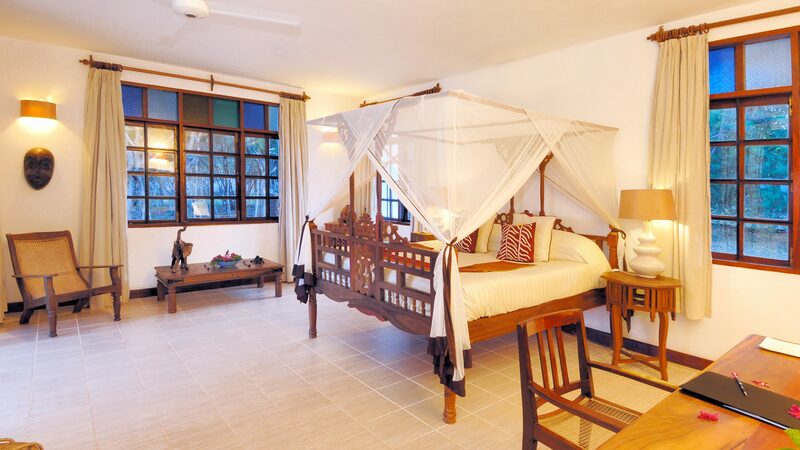 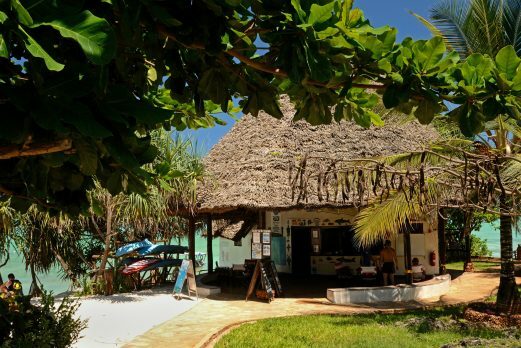 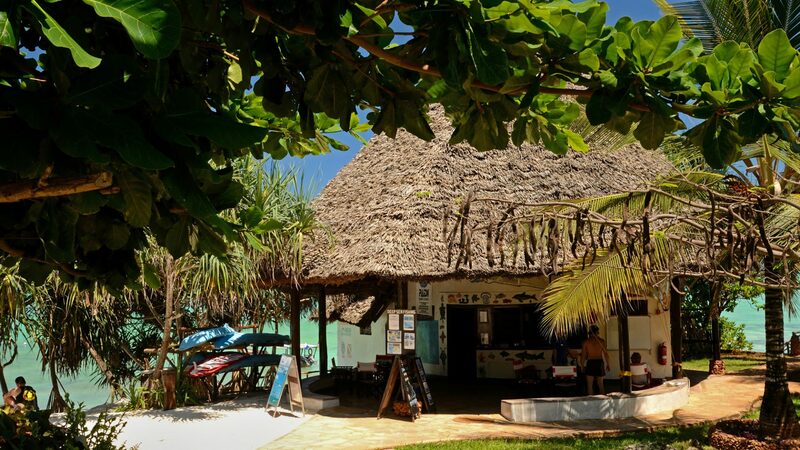 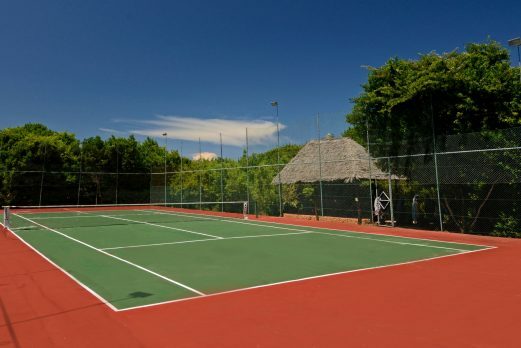 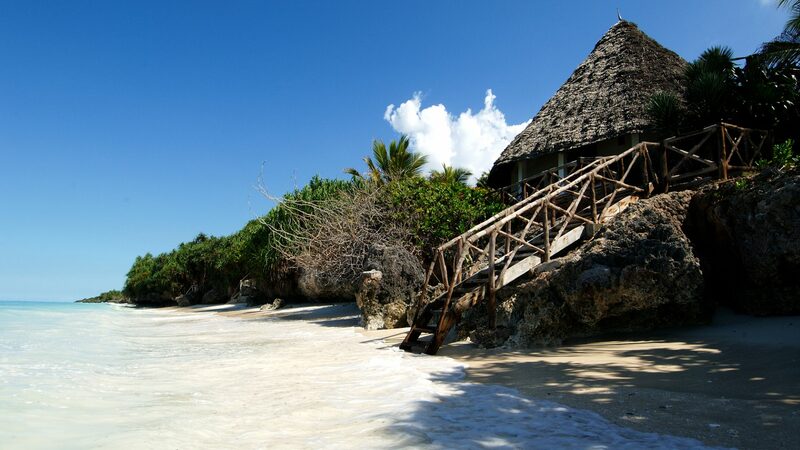 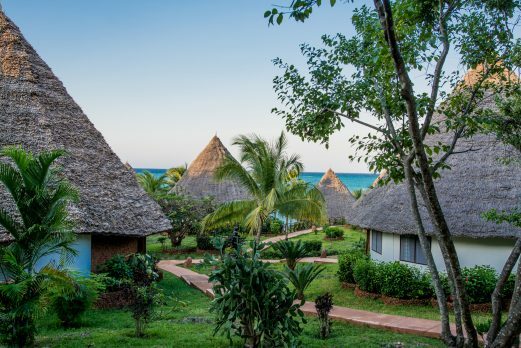 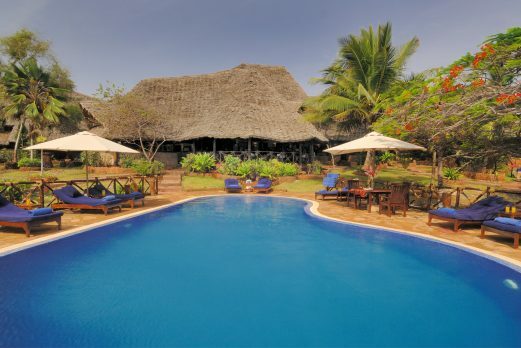 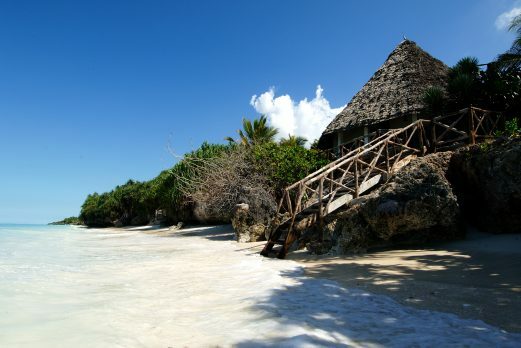 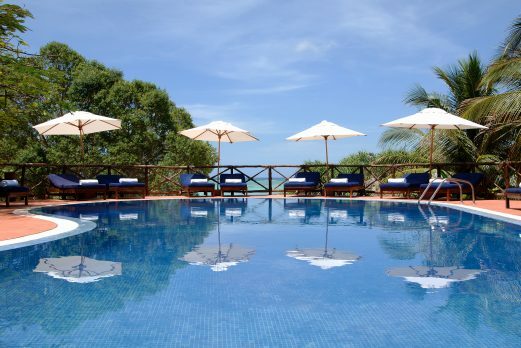 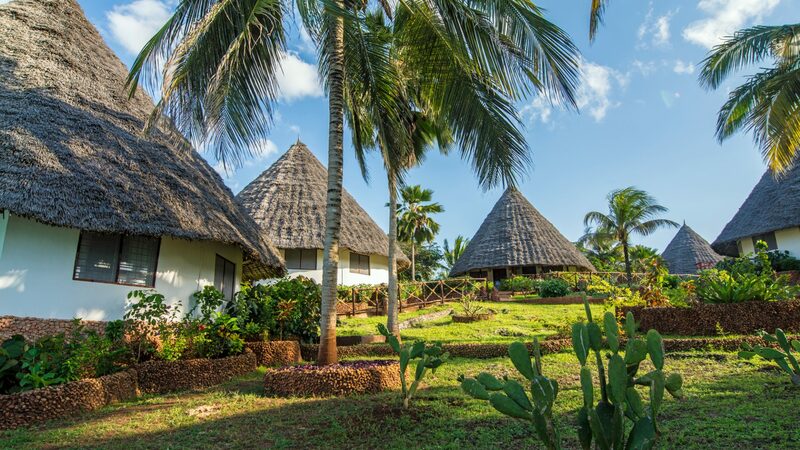 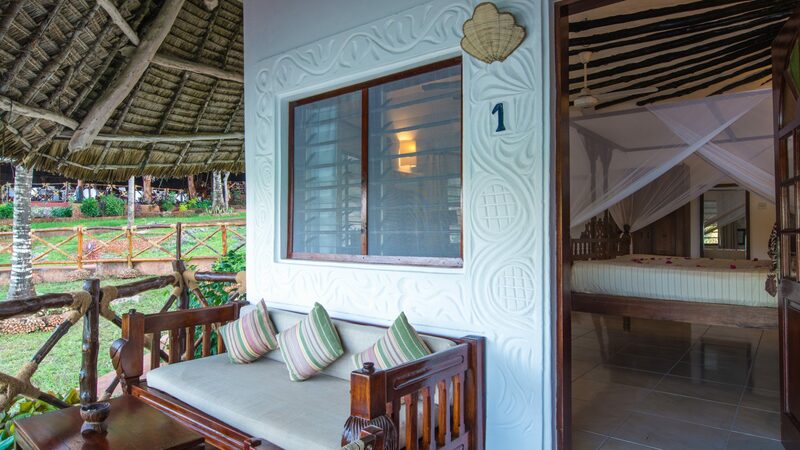 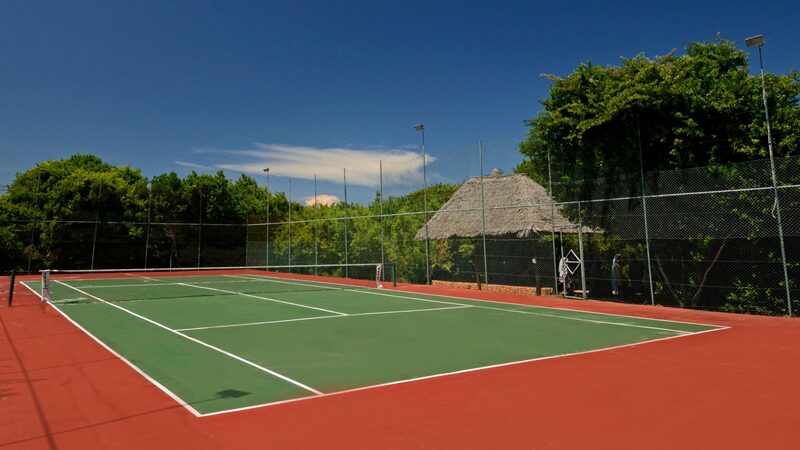 Ras Nungwi is a good mix of resort style hotel and luxury beach lodge. 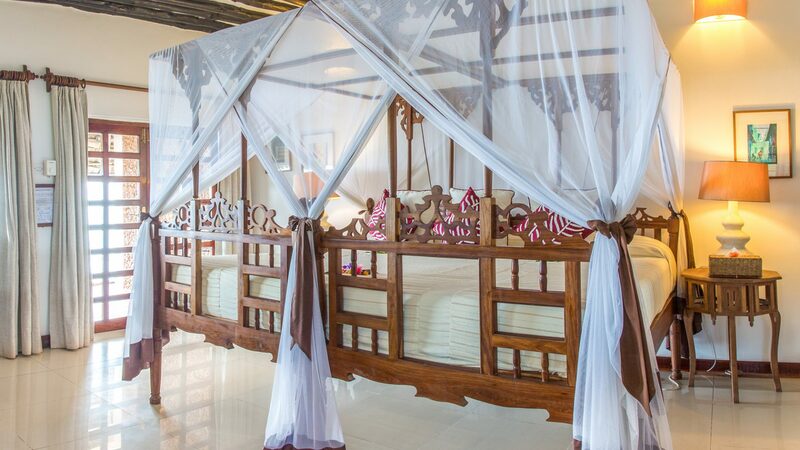 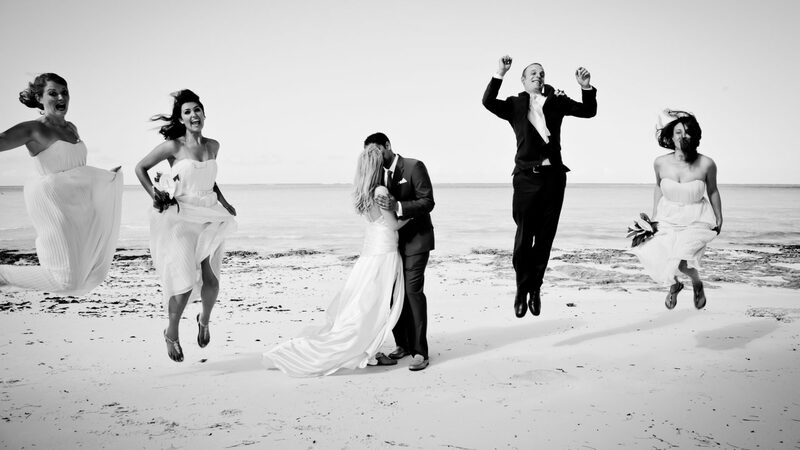 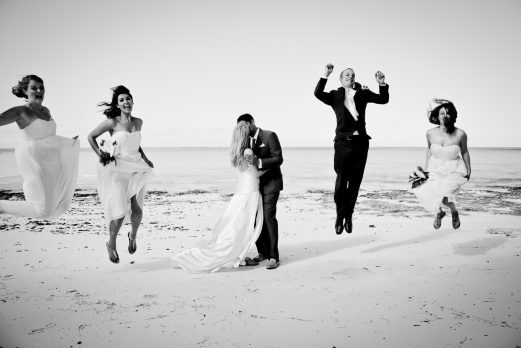 Very popular with honeymooners.